August 23, 2018, 5:00 p.m. Political correctness has a bad reputation. Just 26% of the public in the latest Economist/YouGov Poll say political correctness is a good thing. 43% say it’s bad. That percentage is even higher for Republicans, who describe “PC” as bad by four to one. In fact a majority – 51% – agree that “a big problem this country has is being politically correct.” 78% of Republicans say the same thing. There are limits that Americans put on speech, however. 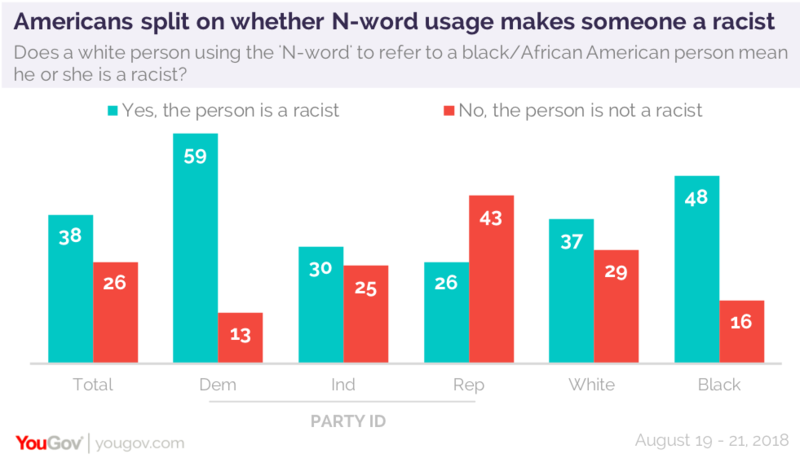 One is the use of the “n-word.” A majority, both black and white, finds its use offensive, and that it is worse when white people use it than when it is used by African-Americans. The offensive nature of the word is agreed on by blacks and whites, and by those of all political beliefs, though by varying degrees. Republicans are more likely than others to say the word is inappropriate. One in three Republicans call the N-world inappropriate, but not offensive. A majority believe the “n-word” is even more offensive when it is used by a white person. 54% overall, and 67% of African-Americans believe this is the case. When it is used by a black person, most think it remains just as offensive. 17% of the total, and 12% of blacks think it is even more offensive when it is used by an African-American. One in four think it is less offensive. Three in four of those who find the word offensive say it is even more so when used by a white person. For many, a white person who used the “n-word” is a racist. Whites and blacks agree. There is party difference: Republicans are less likely to describe a white person who uses the “n-word” as a racist. Independents are closely divided. How often is it used? Only one in ten claim they hear it “often” in regular conversation. However, most Americans say they have heard it used in conversation. Just about half know people who use the word. Whites and blacks are equally likely to say they do. One in four admit they have personally used it. 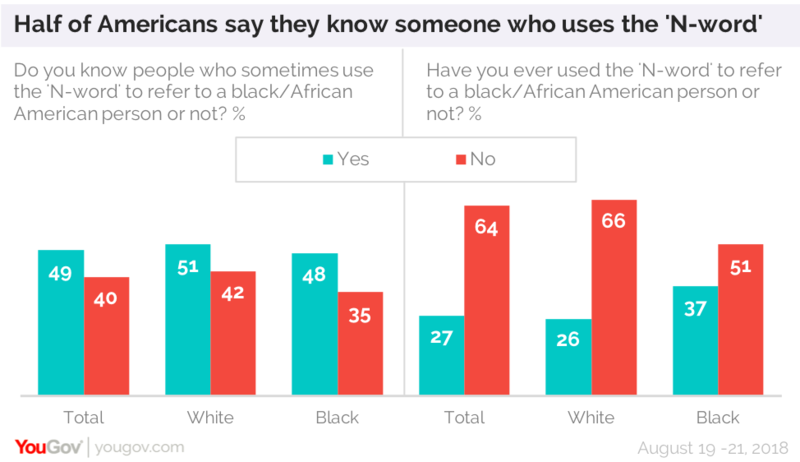 Reported personal usage is higher among blacks than among whites. One in three Republicans, one in three Southerners (black and white) and one in three Trump voters admit to using the word. 22% of those who think the word is offensive say they have used it. Nearly half of Americans think that Presidents Lyndon Baines Johnson, a Southern Democrat, and Richard M. Nixon, a Republican who resigned under threat of impeachment, probably used the “n-word” while serving as President. A third or less think other post-war Presidents have used the word in office – with one exception. More than half believe Donald Trump has used the word in office. While Americans are less likely to say a President of their own party has used the word, more than four in ten Republicans believe Nixon did, and more than four in ten Democrats believe Johnson did. Nearly a third of Republicans believe the current President has. African-Americans are even more willing to believe Republican Presidents Nixon and Trump have used the “n-word” in office. Questions about the current President’s possible use of the “n-word” emerged recently because of claims in a book and in interviews by a former black White House advisor, Omarosa Manigault Newman. Opinions of Manigault Newman are negative. Just 13% overall have a favorable view of Manigault Newman, while a majority of 54% are unfavorable. Only 11% view her as honest and trustworthy, even fewer than the low 30% who see the President that way. More say they would believe neither Trump nor Manigault Newman than say they would believe either one more than the other.